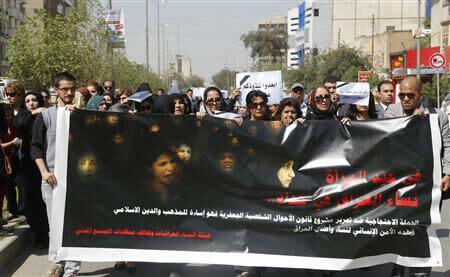 BAGHDAD (Reuters) - About two dozen Iraqi women demonstrated on Saturday in Baghdad against a draft law approved by the Iraqi cabinet that would permit the marriage of nine-year-old girls and automatically give child custody to fathers. The draft was put forward by Justice Minister Hassan al-Shimari, a member of the Shi'ite Islamist Fadila party, and approved by the cabinet on February 25. Shi'ite religious parties first attempted to pass a version of the law in 2003 under U.S. occupation, angering secular Iraqis and prompting protests. Since then, amid Iraq's turmoil, the tug-of-war has continued between Iraq's secularists and Islamists. "This is the core of the freedom. Based on the Iraqi constitution, each component of the Iraqi people has the right to regulate its personal status in line with the instructions of its religion and doctrine," said Hussein al-Mura'abi, a Shi'ite lawmaker and Fadila party leader.